Christmas Carol Special! Live Benefit Show! For many years, members of the Willamette Radio Workshop have given special performances of “A Christmas Carol” for audiences around the Portland metro area who might not otherwise have had any holiday entertainment.Â Now we’re taking this tradition to the next level with a live performance, open to the public, to benefit the Oregon Food Bank. 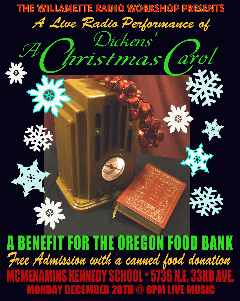 On Monday, December 20, at 6pm, Willamette Radio Workshop presents a “live radio” performance of “A Christmas Carol,” adapted by Cynthia J. McGean from the Charles Dickens story and the Campbell Playhouse version.Â The show will be held at McMenamins Kennedy School.Â While admission is free, we ask for the donation of two cans of non-perishable food per person or an appropriate cash donation to the Oregon Food Bank.Â Envelopes will be available for cash donations. The cast for this performance includes Chris Porter, James Dineen, Greg Alexander, Todd Tolces, Cynthia McGean, Renee Boutin King, Mary Thomas and Sam A. Mowry. Live music and carols will be provided by The Holly Jolly Radio Choir, directed by Bennett Bailey and featuring over twenty singers! Posted in 2010 Season, Live Shows. Tagged 2010, Christmas Carol, live. 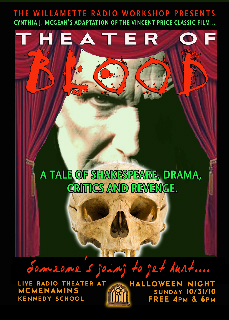 Kennedy School Becomes the “Theater of Blood” for Halloween! LIVE RADIO and HALLOWEEN TRICK OR TREATINGÂ FeaturingÂ THEATER OF BLOOD! Freely and affectionately adapted from the 70’s Vincent Price Classic film by Cynthia J. McGean. as performed live by The Willamette Radio Workshop! Where you ask? At McMenamins Kennedy School,Â in the Gymnasium. A special treat for the kids, avoid the rain and still get candy. Trick or Treating from 4:30 ’til 6:30 p.m.; Live Radio shows at 4 p.m. and 6 p.m.
Free!Â All ages welcome;Â kids with adults only. Bring your kids-in-costume for trick or treating so you enjoy a handcrafted ale, wine or spirit as you wander the halls together! Afterwards (before they get too far into their bags of loot), have dinner at the Courtyard Restaurant, which has a kids’ menu — nothing like a grilled cheese sandwich or a corn dog followed up with candycandycandyyeeahhhh!!!!! After trick-or-treating, check out two free performances of “Theater of Blood” performed by Willamette Radio Workshop. The shows will begin at 4 p.m. and 6 p.m. The Willamette Radio Workshop is happy to present a live radio adaptation of the stylish 70s Vincent Price horror movie “Theatre of Blood”. A show to delight Shakespeare-lovers and horror-fans alike.Â The quotes and bodies fly about like autumn leaves. What could be better for Halloween? Spurned by the Theatre Critics Circle, aging Shakespearean actor Edward Lionheart takes bloody revenge in a series of murders inspired by Shakespeare’s greatest plays. The critics variously meet their theatrical ends by stabbing, strangling, having their heart cut out, and being forced to eat a pie with their pet dogs.Â Will Lionheart finish his greatest work before the police tie together the grisly clues?Â Join us this Halloween for the surprising answer. This murderous tale of full blooded Shakespeare and artistic retribution is freely and fondly adapted by Cynthia J. McGean and directed by Sam A. Mowry. Original music is composed by Marc Rose and Galen Huckins. Live Foley by David Ian and Dino de AElfweald. Live sound by Robert Kowal. The cast includes Chris Porter, Mark Homayoun, Bill Barry, James Dineen, Lindsae Kline, Megan Murphy Ruckman and Sam A. Mowry as Edward Lionheart. As if that weren’t enough, we are also participating in a transcontinental Halloween festival on the air, so to speak. The Transcontinental Terror Train. Details below. This Halloween, six audio theater companies from around the world are teaming up to present a full evening of original audio horror! “Transcontinental Terror: An Express Train to Audio Horror” will feature six hour-long productions by contemporary audio theater’s most exciting, inventive production companies — companies spanning half the globe. The programs will stream online at www.transcontinentalterror.com, beginning at 5:00pm EDT and running until 11:00pm EDT. The six production companies involved in the project are: The Wireless Theatre Company from London, England; Electric Vicuna Productions from Halifax, Nova Scotia; FinalRune Productions from Portland, Maine; Chatterbox Audio Theater from Memphis, Tennessee; Icebox Radio Theater from International Falls, Minnesota; and The Willamette Radio Workshop from Portland, Oregon.Â The numerous accolades earned by this group include Gold Ogle and Mark Time Awards, and features in numerous local and national papers including the Guardian and The Wall Street Journal.Â This collaboration marks the first live web-based audio horror marathon, which debuts 6 hours of new material by these artists. This year we are producing six original shows, the result of a months-long collaboration among the groups.Â Some of the shows will be recorded, using state-of-the-art production methods, field recording, and actors from across the globe. Others, including the Willamette Radio Workshop, will be performed live in front of a live audience with manual sound effects, just as in the Golden Age of Radio Drama. Though terrifying, all of the evening’s content will be radio-friendly. Radio stations are encouraged to broadcast the online feed. For more information on the show itself each participating group, scheduling, and more, visitÂ www.transcontinentalterror.com. Posted in 2010 Season, Live Shows. Tagged 2010, Halloween, live. Members of WRW including Sam A. Mowry, Mary Thomas, Mark Houmayoun and James Dineen lend their voices to the 1982 classic.Â Click on the poster to see the trailer and get more details, including how to buy tickets for this one-time-only show! Posted in 2010 Season, Live Shows. Tagged 2010, filmusik, live. 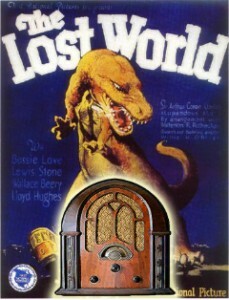 The “Movies in the Park” series from Portland Parks & Recreation continues, offering this weekend the ambitious presentation of the silent classic The Lost World, featuring an original score performed by Filmusik Chamber Orchestra, joined by Willamette Radio Workshop, (Mark Homayoun, Sara Rae, Tim Riley and Sam A. Mowry) plus live Foley sound effects by David Ian and Dino de AElfweald. This masterwork from 1925, a simpler time when claymation monsters ruled the earth and hunted unwitting saps in bowler hats, offers a new challenge to the Filmusik/WRW collaboration. Our group of musicians and actors recreate this classic in the open air under the mega-screen for this one-time-only performance. Co-sponsored by the Richmond Neighborhood Association, the screening happens at Sewallcrest Park, Southeast 31st Avenue and Market Street. Pre-movie entertainment (Music by Megafauna and a Live Radio Drama intro to the movie) starts 6 p.m.-ish, and movies begin at dark. Admission to Movies in the Park events is free. 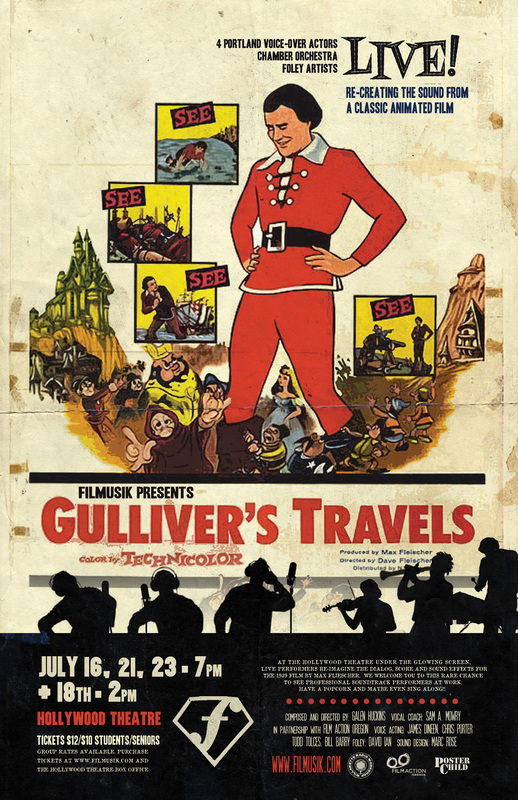 The collaboration between WRW and Filmusik continues in July with the presentation of the 1939 Fleischer brothers animated feature “Gulliver’s Travels.”Â WRW Director Sam A. Mowry will direct the voice acting cast to provide the voices of adventurer Gulliver and the hundreds of tiny citizens of the fairy-tale land of Lilliput. David Ian will lead a team of foley artists to create live sound effects, while Marc Rose is sound designer.Â Filmusik founder Galen Huckins has composed an entirely new score for the film, which will also be performed live.Â There will even be opportunities for the audience to be a part of the show — follow the bouncing ball and sing along! The show promises that you’ll never look at cartoons the same way again! Posted in 2010 Season, Live Shows, Other Projects. Tagged 2010, filmusik, live. WRW celebrates the 11th annual McMenamins UFO Festival with the classic sci-fi adventure serial, “The Amazing Interplanetary adventures of Flash Gordon.”Â A special compilation of the first four episodes of the 1935 weekly serial, which we are calling “Marooned on Planet Mongo!” will be presented at 2pm Saturday, May 15 in Mattie’s Room at McMenamins Hotel Oregon in McMinnville.Â The show is free. The cast includes Scott Jamieson, Mary Thomas, James Dineen, Mark Homayoun, Carole Dane, Matthew Richards and Sam A. Mowry. Originally aired in the spring and summer of 1935, “The Amazing Interplanetary Adventures of Flash Gordon” was a very faithful adaptation of the Alex Raymond comic strip, starring Gale Gordon as the heroic Flash, Maurice Franklin as brilliant scientist Dr. Zarkov, and Bruno Wick as evil overlord Ming the Merciless. 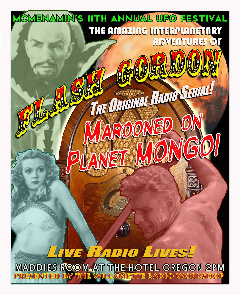 WRW has presented individual episodes of “Flash Gordon” at past UFO Festivals, most recently in 2007, but this is the first time the “Brave Earth man” has been at the top of the bill! For more information about the UFO Festival, check out the McMenamins site.Â There’s no charge to attend “Marooned on Planet Mongo!” but if you’d like to support WRW, we will have CDs of other WRW shows available for sale before and after. Posted in 2010 Season, Live Shows. Tagged 2010, flash gordon, live, ufo fest. Some of Portland’s finest actors and singers present an ingenious evening of poetry in performance. VOX, a unique spoken-word chorus, performs poetry as music. Phrased by actor and director Eric Hull, and selected with the guidance of poet and PSU professor Michele Glazer, the poems are arranged much like a musical score. The results express the natural music of the poetry through vocal performance. Download an audio sample at www.voxpdx.com . Selections include “Do Not Go Gentle Into That Good Night” by Dylan Thomas, the luscious love poem “She Walks In Beauty” by Lord Byron and “Hate Poem” by Julie Sheehan. Ursula Le Guin’s “Angel”‘ is also on the bill. There is also a medley of poems by William Stafford and Kim Stafford. This is the third VOX performance. The chorus is building on successful productions last spring and winter. VOX audiences experience poetry in performance from a fresh, unforgettable perspective. 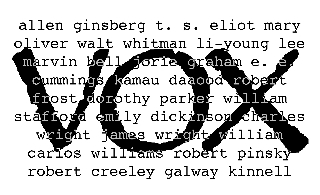 Poets: Dylan Thomas, Gertrude Stein, Michele Glazer, William Stafford, Kim Stafford, Maya Angelou, Li-Young Lee, Lord Byron, Cornelius Eady, Omar Khayyam, and more. Chorus: Gary Brickner-Schulz, Grant Byington, Adrienne Flagg, Theresa Koon, Sam A. Mowry, and Jamie Rea. Directions: Take N. Interstate Avenue to N. Tillamook. (Look for the “Poetry” sandwich boards.) Turn west onto the overpass. Follow Tillamook as it curves downhill. Turn right at the next street, Lewis. Turn right at the next street, Loring. You may park in the lot on the right. Enter on the corner of Loring and Albina. VOX is funded in part by the Regional Arts & Culture Council and Work for Art. Posted in 2010 Season, Other Projects. Tagged 2010, VOX. Join us for the Julians premier performance on Friday, April 9th at 8:00 p.m. at the amazing Splendorporium Gallery, 3421 …SE 21st Ave! 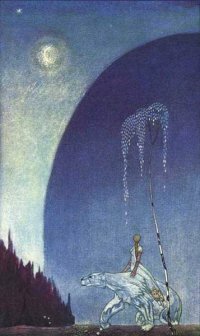 “East of the Sun West of the Moon” is a night of music making and story telling, combining classic fairy tales with a mash-up of vocal music. We’ll combine such tales as “The Fisher King,” “The King of Cats,” and “The Golden Key” with music by Tormis, Sondheim, Kocsar, Bjork, and Distler. The Julians are proud to welcome Sam A. Mowry and Alyson Ayn Osborn of the Willamette Radio Workshop for this one night only performance! Entry is a suggested $10/$8, and is available at the door. Cash only please. Don’t miss this amazing night of performance, the first for the Julians, the fresh PDX female vocal ensemble. Posted in 2010 Season, Other Projects. Tagged 2010, live. The Hobbit Is (There and) Back Again! Come join the Willamette Radio Workshop as we make another journey to Middle-earth with “The Hobbit’s Greatest Hits,” our one-of-a-kind adaptation of the J.R.R. Tolkien classic. We start at the beginning and end at the end, but a lucky draw from the hat will take us to “The Trouble with Wargs,” “Roast Mutton,” meeting the “Trolls, Goblins and Riddles in the Dark,” or any number of other mysterious destinations in Middle Earth. The performance is set for 2pm Saturday, January 16, 2010 at the McMenamins Kennedy School, part of the annual J.R.R. Tolkien Birthday Celebration. The performance is absolutely free, but remember: when you come to Middle-earth, you too may be called into service! 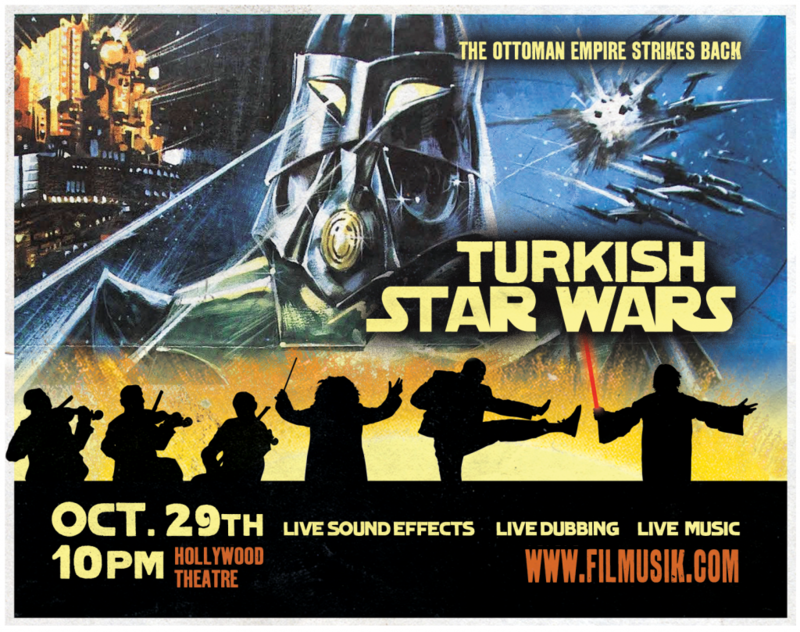 Audience participation includes the battle of the Five Armies and a costume contest judged by you, the audience. Prizes will be awarded. What more could you ask for? Posted in 2010 Season, Live Shows. Tagged 2010, hobbit, live.